Here at Wolf Paving, we care about ensuring our work is the very best it can be and that it lasts as long as possible. To achieve the best results, we carefully consider every aspect of a paving project, literally from the ground up. What kind of soils exist at the site? If paving has been done before, what materials were used and are they re-usable in the current project? We ask these questions because we know an excellent base is required for an excellent result. 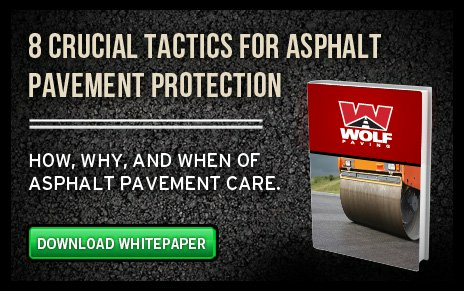 A weak base could result in the pavement above it shifting, cracking, or even sinking. When we’ve analyzed the soils and any existing base at the site, we consider whether soil or base stabilization is needed. If the soils or base are not strong enough for the paving surface to last in good condition for a long time, then stabilization needs to be undertaken. Soil stabilization is one part of base stabilization. It’s the permanent alteration of the underlying soil’s chemical and physical properties to enhance its strength. Usually this means that additives like lime and concrete are mixed into the soil to harden it. This needs to be done if the soil will not be strong enough on its own to maintain the layers above it properly. Base stabilization is very similar to soil stabilization: existing base material is modified to improve its strength and durability so that asphalt can be paved properly over it. This process also reduces the plasticity and lowers the water content of the base. Base stabilization usually starts with pulverizing whatever existing materials are on the site. Then the appropriate additives, like cement powder, are spread on the surface. The pulverizing machine is used again to mix the additives in with the base materials to a set depth. The concrete or other additives then go to work, hardening the other materials. Once the appropriate moisture and hardness are achieved, the material is compacted to reduce spacing and air between the materials. This usually requires several passes with a roller. Finally, a grader is used to ensure a smooth surface on which the asphalt paving will be laid. The result is a level, attractive, strong, and long-lasting paved surface. 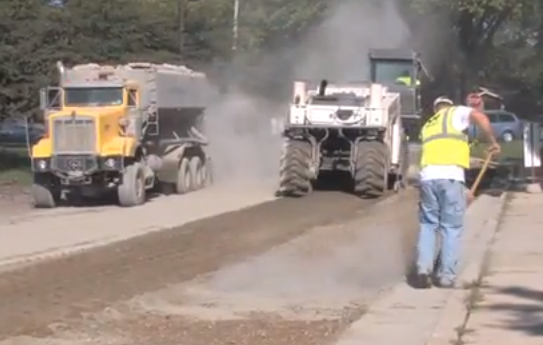 Check out this video of a base stabilization project completed by Wolf Paving. Want your paving project done the right way from the ground up? Contact Wolf Paving for a quote today!